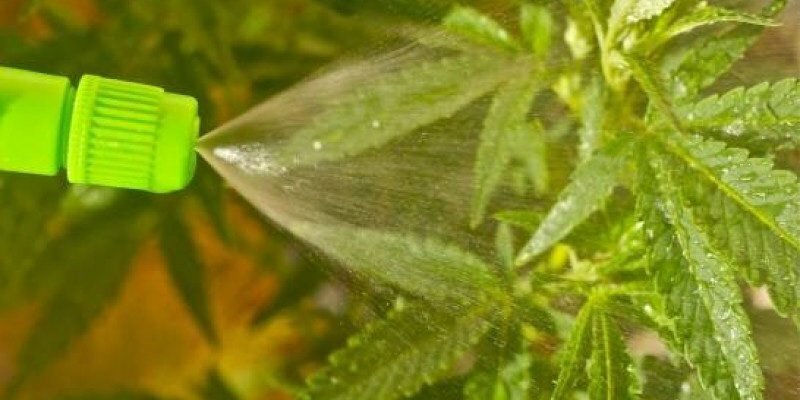 Foliar feeding can be incredibly beneficial for your marijuana plants. 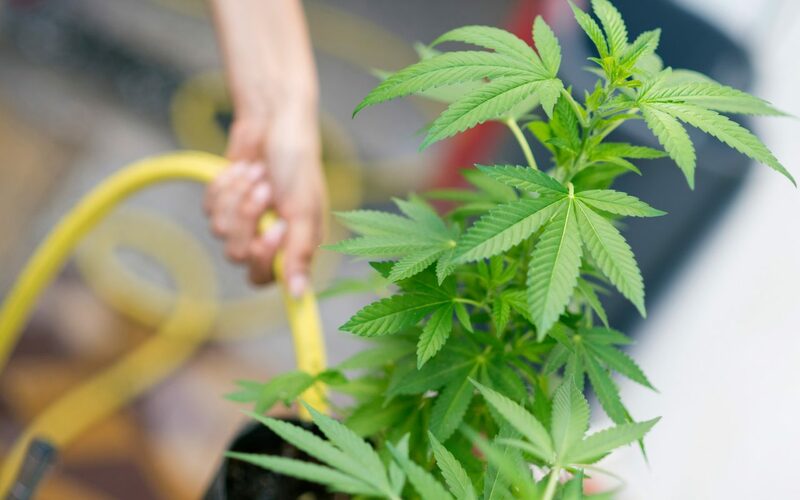 Although this tends to go against popular perception, marijuana plants require regular spraying and/or misting. Plants can and will absorb nutrients from their leaves with a nutrient solution mixture. Foliar feeding provides a rapid boost to your marijuana plants, ultimately producing larger, better, and more bud-filled harvests. That being said, foliar spraying cannot replace a standard root feeding regimen. Instead, it provides a quick way to get supplementary nutrients to your plants. Foliar feeding essentially means that you spray fertilizer straight onto the leaves. It provides nutrients via foliage rather than roots. The process has been the subject of a number of scientific and anecdotal studies, prompting many growers to use it in their growing programs. A regular regimen of spraying feeds the plant via its stomata—microscopic openings situated in the middle of two guard cells—with direct nutrients. Regular spraying also provides clean and open stomata for your plant. Alterations in water content around the guard and other secondary cells force the stomata to open and shut as a basic response to water status changes. Download my free grow guide for more tips about foliar feeding marijuana plants. Marijuana plants continue with the process of photosynthesis by mixing together a number of different ingredients in their leaves. Materials can be gaseous (e.g. carbon dioxide), liquid (e.g. water), and energy (light). Simply looking at the plant’s leaves gives you an insight into how they can create food. Stomata are vital for providing access to and from the plant for gaseous materials. Stomata are like tiny pores in the skin of your plant. If more carbon dioxide is necessary for photosynthesis, the stomata will open. If the leaves overheat and need to let water escape during transpiration, the stomata will open, allowing the water to leave. TIP: Grow your own marijuana? Buy your seeds in my shop. Clones, young plants, seedlings, and every marijuana plant in vegetative state will experience extreme benefits with foliar feeding. Because clones aren’t rooted, they require foliar feeding as a means to develop roots and avoid yellow discoloration (a frequent problem for cloners). When a marijuana plant enters flowering stage, it is advised that you stop foliar feeding. Marijuana will naturally secrete a resin for insulation when the environment is hot and dry. This keeps the plant cool. If you use foliar feeding during flowering, then it’s important to decrease the temperature of the plants to avoid mixing fertilizer with the resin. Indeed, foliar feeding is only recommended from vegetative state until about two weeks into flowering. You also don’t want your plants to have any residual nutrients on the surface when you harvest. It will result in a heavy, nutrient-infested smoke. Any fertilizer that is created for soil or hydroponic systems is perfect for foliar sprays (especially ones that have trace elements, or micronutrients). In most cases, you should mix the fertilizers at reduced strength to avoid fertilizer or nutrient burn. 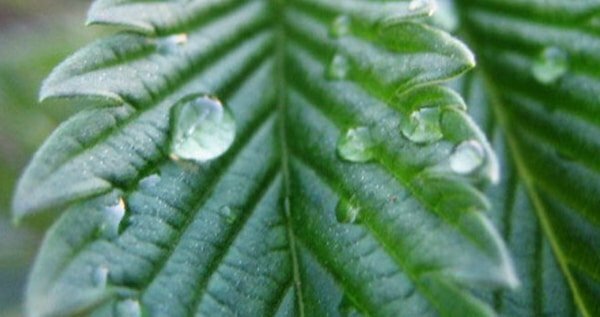 A spray with a strong mixture of nutrients couples with bright, intense light can produce light reflection from water droplets that causes your leaves to burn. Foliar feeding is ideal with mist-style sprayers. Small particles will result in a better response from your plants. You will also have to use less fertilizer to achieve the exact same result. Spray with a fine-misting spray bottle. 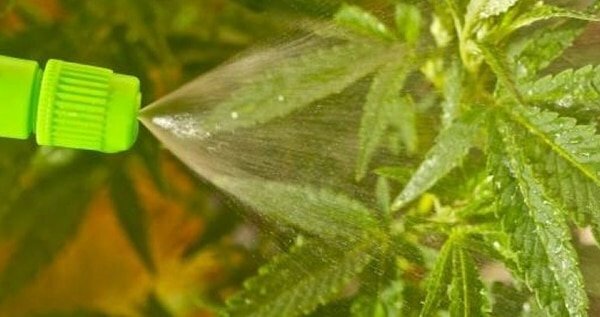 Spray the entire marijuana plant. Foliar feed clones, seedlings, and plants in vegetative state. Stop foliar feeding two weeks into flowering. If you want start growing your own marijuana? Download my free grow guide and order some high quality White Widow seeds at this link here (5 + 5 free). We ship seeds to the US, CA and many other countries. For any growing related question please visit the marijuana support page. Thanks for all the information that you make available for a new grower . I am 5 weeks into my first grow from seed so far I'm very impressed! !!!! Thanks again. can i spray just water every morning on plants that are past 2 weeks of flowering? EHAD, NO. You put your plants at risk for mold//mildew and other issues if you spray water on them in flower. Also; This would make your humidity spike.